Tallangatta Triangles Park is located in the centre of the town and is popular for tourists and locals alike. Bring the kids down for a play at the large playground or perhaps invite the family down for a barbecue in the undercover area. Many local events are held in the Tallangatta Triangles. 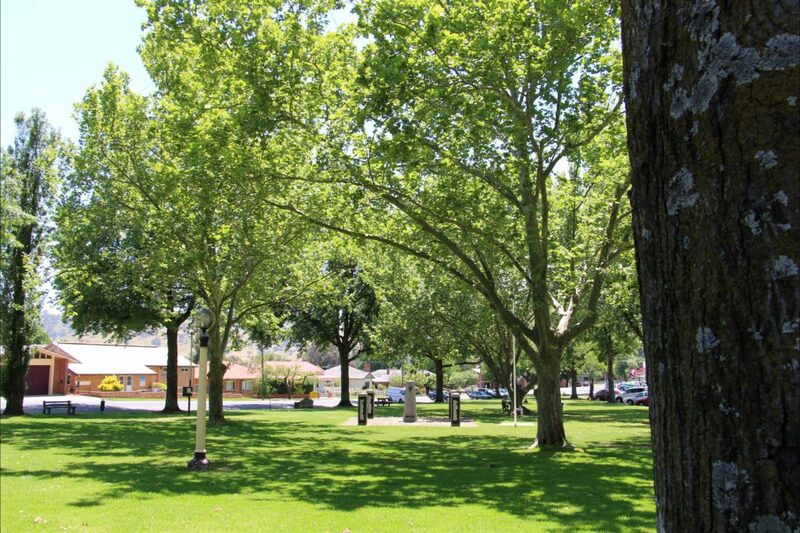 Beautiful large plane trees in the park were moved from Old Tallangatta town and offer ample shade in the warmer months. Tallangatta Triangles Park offers plenty of picnic tables and chairs, several bench seats, rubbish bins, a war memorial, vintage lamp posts, several drinking fountains, public toilets (including disabled access and baby change facilities), a static information centre, large undercover area and several barbecues. A great stop for the family with a large shade sail for the kids to enjoy play out of the hot sun, a playground with several swings, slides and more to offer the young members of the family and a sculpture for the adults to admire while the young members of the family are playing.